Hello friends, we know very well that browsing software is the gateway to enter in the internet world, so, today we talk about the most important browsing software Google Chrome 64bit, and it is free to download, it is developed by the Google Incorporation. At present approx. 50% internet users, use “Google Chrome” web browsing software due to the reason of it is much safer, faster and easy to use which provides different features like CSS and HTML5 web standards. It easily works on iOS, Android, Linux, Mac OS x and different versions of windows operating systems like SP2, Windows7 and Vista. It is available in 32 and 64 bits, the main difference is that Google Chrome 32bit is used in windows xp, sp1, sp2 but if any user want fast web browsing access on windows 7, 8 and upper versions then they have to use 64 bit in his computer. Everybody who is working on internet want complete security due to prevent hacking his personal and important data from un-authenticated persons. It is much secure than 32 bit, because 64 bit Google Chrome also uses different advanced features of windows operating system to secure your running web based processing. Google Chrome 64bit is much faster as compared to 32 bit to running different web applications. It provide 25% better performance to running web application, with visual effects. When using 32 bit Google Chrome on your system, lot of time your data will be crash during few technical or browsing software problem, but in 64 bit your data crash problem is reduced up to 50% and you can easily running different web application without fear of data crash problem. If you want to upgrade or install Google Chrome 64bit first you have to check your windows operating system is 64 bit or not, by clicking right mouse button on the My Computer icon and then after click on the Properties option. 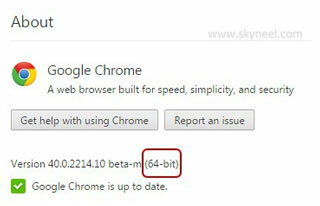 If you have windows 64 bit version then you can easily upgrade or newly install 64 bit chrome on your system. To install you have to click on this link to easily and quickly install 64 bit chrome on your system. After clicking this link downloading process will be start then after follow step by step instructions to install it on your system. After flashing messaging your installation is completed, reboot your system. You can also check that which version of chrome is installed in your pc by typing chrome://chrome in the address bar of chrome window then press enter. Note: If any user want to install both 32 bit and 64 bit versions of chrome in his system then you can install chrome either from canary or dev channels once again in your system. I hope you like this article. Use Google Chrome 64bit in your system and enjoy fast browsing speed with secure process. Give your important suggestion in the comment box regarding this post. Thanks.